Money is one of those topics no one wants to discuss. It’s personal. It makes us uncomfortable. When Pastor Nathan asked me to share about what Christ did for me on my journey to becoming debt free, I immediately thought--no one wants to hear about budgets and Dave Ramsey and debt snowballs. But in reality, my journey had less to do with money and more to do with surrendering myself to Christ. When I started the Dave Ramsey program eight years ago, I had never written down a budget, much less calculated how much debt I had, so I was in complete shock when I realized I owed 59,496.03. Other than a car and a few thousand dollars of student loans, I honestly cannot tell you what I bought. I serve as a school librarian, so I’m guessing it was a lot of cardigans. I began working the plan, full of optimism and determination to make a budget, stick to it, and get out of debt. But regret over bad decisions only gets you so far. Some months I would do well, but many months, I would drain my savings or use my credit card. I continued in that cycle until a year and a half ago. On a Wednesday night, Pastor Nathan talked about reaching unreached people groups. He said there were people who had not heard the gospel because they are in such remote places that we’d have to build roads just to reach them. He spoke about the money it would take to build those roads and the training for the missionaries to share the gospel and the cost of translating Bibles into that language. I can’t tell you what he preached on that night because I couldn’t quit thinking what 59,496.03 plus interest throughout the years could have done to advance the gospel. I know God doesn’t need my money, but I had missed a chance to join him in the work he’s doing to make the name of Jesus known around the world. The regret I had over bad financial choices turned to godly sorrow that I had put stuff I can’t even remember buying above the advancement of the gospel. I went home, got on my face in my prayer closet, and repented for not trusting His plan for the money He had given me. I realized God’s goal wasn’t just for me to be debt free--it was for me to completely surrender control of my finances to him. I had only told two people ever how much debt I had. Now, I was sharing my monthly totals on social media with strangers. With a changed heart, I began to make different decisions, not just with the mindset of getting out of debt but with pleasing the Lord with my money. I wish I could tell you that I surrendered to his lordship, and it was easy. It was still a year and a half of hard choices, of lonely weekends, of dying to my selfish desires. But, it was one of the most beautiful times, as Jesus poured out His grace to me through His word and encouragement from friends and even strangers. On February 15th, I made my last payment to Discover, and with the next paycheck, I paid to go on my first mission trip with NEHBC. While being debt free feels amazing, the true blessing was Christ using the long journey to fill my greatest need--more of him. Throughout my journey, I kept coming back to Philippians 4:11, where Paul wrote “Not that I am speaking of being in need, for I have learned in whatever situation I am to be content.” Even though I hated dying to my selfish desires, the more I surrendered to Christ, the more content I became despite my circumstances. He is enough. It's been six months since I got back from Mozambique. You can't travel to a country halfway around the world and not be changed, but I wanted to wait and see what feelings were a mission trip hangover and which ones were real changes God was making in my life. The women of Mozambique are beautiful. I love their bright colors, vibrant laughs, and open friendliness. Their front porches are a place to work and watch their kids and build relationships. They sit and laugh and call out to those passing by. Even though I didn't understand a word of Portuguese, I understood the sense of community. Stories would be told and the gospel would be shared, and it was glorious. And I have missed it. I consider myself an extroverted introvert. I like people and enjoy their company, but I have to have quiet, alone time every day. I'm not quick to introduce myself to a stranger in a crowd. I'm better one on one than with a group. I can be shy. But God used Mozambique to change me. I call out to women in passing and pause to see if they're willing to talk. Every Sunday night, I purposefully think of who I can reach out to that week to encourage or to pray for or to just hang out with. I long to be still and hear their stories and share my own. There's a longing in me to build a community, one of women who encourage and build each other up, women who are different than I am, women who will sit on the porch and talk about life and Jesus, women who laugh, women who challenge each other. And I think women in my area desperately need it. We run in rat races and fight comparisons and worry so much about status that we have become empty. We have nothing to give those around us. We're too busy to sit on our porches, making a meal together while the kids play. We don't have time to be still and talk about our struggles and the answer to them--Jesus. We don't have people who will call us out in love because we're too afraid of offending and too scared to be vulnerable and open. And our community suffers. The world is broken. We live under the curse of sin. Suffering surrounds us, suffocating us. Anxiety and panic plague us. All too often, we trudge through it alone. And we don't have to. There are so many women looking for something beyond surface level acquaintances, women who desire true friends who stick closer than a brother. One of us just needs to be brave enough to ask, "Hey, you want to come hang out on my porch later?" I think of the women of Mozambique every day. Out of respect for them, I didn't take many pictures of them, but their smiles fill my memories. They inspired me to reach out to those around me, to build relationships, to form a community. I don't want to have a busy social calendar but not one woman who is like a sister to me. I pray I can go back. Waiting is really hard. And when you're in a long season of waiting, you're desperate to find any answer or encouragement along the journey. 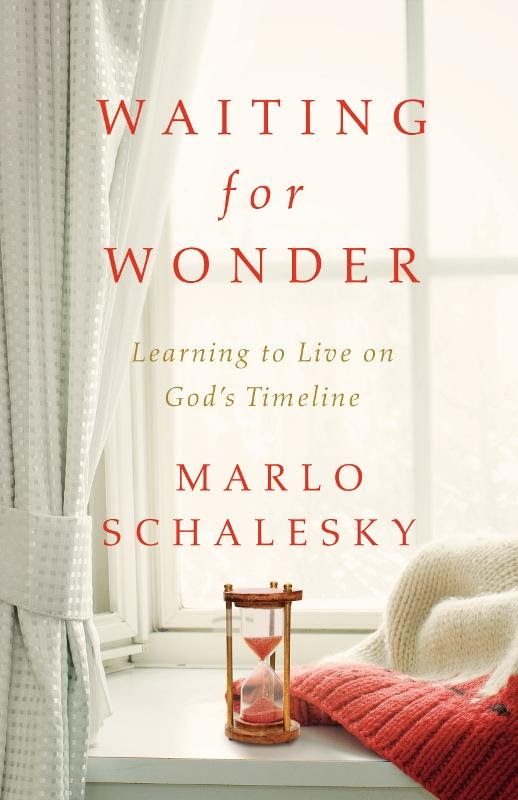 And this book is just that--an encouraging reminder of God's sovereignty and His hand in every season of life. 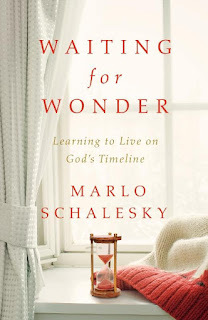 What I loved about this book was that it followed the life of Sarah from the Bible, gleaning lessons from each part of her story. I also appreciated that the book didn't give the false hope that if you just follow these steps, you'll get whatever it is you're waiting for. Instead, it focused on the ultimate gift, Jesus. I found myself skipping the narrative parts, where the author imagined what Sarah may have been feeling or thinking during her experiences, but perhaps others will find that a nice bonus. I preferred the focus on the scriptures, their meaning, and the application. 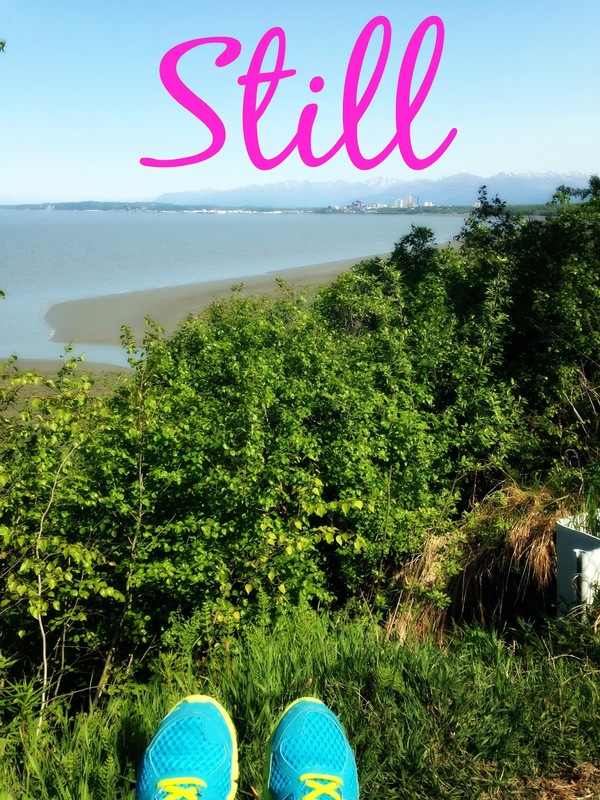 Overall, I would recommend this to anyone who has grown weary in her season of waiting. I received this book in exchange for my review. My thoughts are my own. This summer I dated this guy. On paper, he was exactly what I had been praying for. Loves Jesus. Thoughtful. Quirky. And he's debt free. My sister has been telling me for years that my debt would be a problem when it came to dating relationships. I didn't believe her. After all, I had embraced the lie that everyone has debt, that debt is normal, and that debt is even expected. But, it's not. My debt was a huge concern for him--and rightfully so. We didn't date long and there were other reasons it didn't work, but I'm very thankful for those couple of months this summer because it woke me up to debt's effect on my entire life--including dating relationships. 1. Being single and in debt is hard. There's no one to go over your budget, bring up issues, and hold you accountable. Find someone to be your Budget Buddy (or something a little more clever). Someone who can ask you questions, go over numbers with you, encourage you. And listen to them. 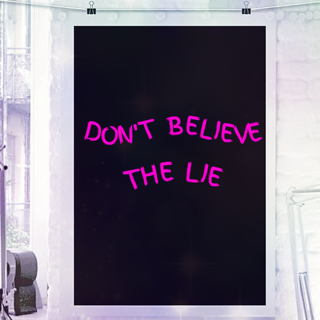 There were people who tried to hold me accountable in this area before, and I shrugged off their advice. But there's such encouragement when we allow people to speak bold truth into our lives for our good...even if it hurts to hear it. 2. Recognize debt for what it is. My friend Lauren described it to me as "tangible gluttony," and that's so true. We get into debt because we want more than we can afford and often because our desires overrule our common sense. We can get out of debt, but if our hearts don't change, we'll find ourselves right back where we started. Like with other sins, to overcome tangible gluttony, our hearts have to be transformed by the power of Christ to crave the things He wants us to crave more than we want another cardigan or tickets to a Rockets game. And it's really hard to die to our selfishness. But, it's for our good and His glory. 3. "They" say that money is the number one reason couples get divorced. So, why would we want to carry debt into our marriages? Singlehood can be a time to focus on getting out of debt and becoming financially secure on our own. Any other advice or encouragement for us single girls struggling with debt? Many of us believe the lie that debt is normal. School loans. Car payments. Proverbs 22:7 says "the borrow is slave to the lender." If I clear 1, 686 dollars a paycheck but have to pay 800 or more to either Bank of America or Discover, I'm not in control over that money, the credit card companies are. So, that's 800 a check (1,600 a month) that I have no say over. It's money I can't give to organizations like A21, a non-profit fighting human trafficking. It's money I can't use to go on a mission trip or give to a missionary spreading the gospel to unreached people groups. It's money I can't use to buy books to give to kids who don't have books at home. And that sobering thought is why I'm up at 2:30 in the morning writing this blog. Debt is unacceptable because it keeps me at the mercy of credit card companies--how much interest will they charge and what will my minimum payment due be? Debt keeps me tied to earthly things when my heart wants to invest in spiritual things. And so I'm left with sorrow, great sorrow at what my sin has cost me--the chance to give lavishly to the kingdom of God. But the beautiful thing about Christ's grace is that it is always there, whether it's the first time I've sinned or the hundredth. So it's not too late for me. Or you. When I look at my debt numbers (read about it here and here), it makes me sad to think of what I could be using that money for. It also makes me mad I was selfish and greedy. It breaks my heart that I let sin guide my choices. So I lie here broken but thankful. Because godly grief over my sin changes me, it produces a repentance that refuses to live in sin any more. And that is incredibly freeing. But to be financially free, we have to take action. First, we can take a long, honest look at our debt and what our selfish choices have cost us--not just financially but emotionally and spiritually as well. And then we can let that grief and anger change us for the better. Because I don't know about you, but once I climb out of this hole, I'm never going back again. 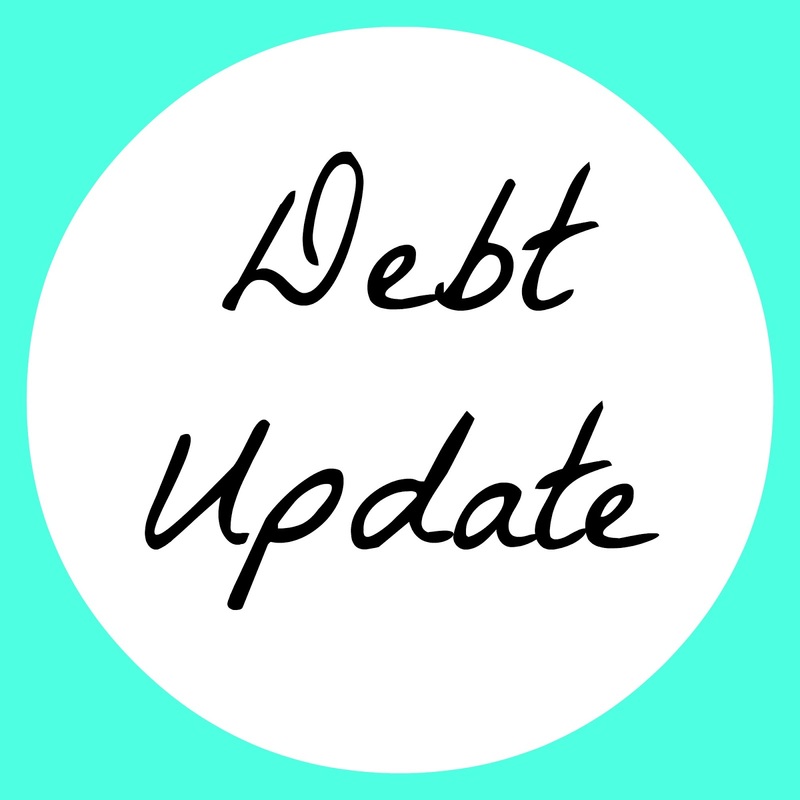 Two weeks ago, I opened up about my debt journey. It was hard. However, today feels harder because I should be debt free by now. I can list a hundred things I should have done differently over the years. I can't change those things. 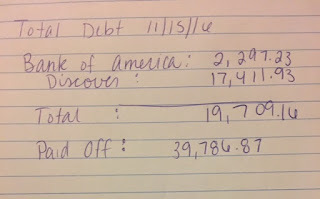 Seeing my total debt go up the last couple months was a huge wake-up call. I had to pray and ask the Lord to forgive me for using His money for my own desires instead of advancing His kingdom. He's so faithful to forgive, and I'm eager to see how He uses even my own failures for my good and His glory. So, here's where I am. Only two debts left. The light is there at the end of the tunnel. Now, you may notice that my Discover balance is HUGE, a lot higher than when I started. I'm sure a lot of it I can't explain. I did put some of my graduate school on it. I went on this vacation this summer. I was in a wedding and spent more than I expected. There's no excuse. Just transparency with complete strangers. So, tonight I changed the card connected to my Amazon account to my debit card. It's a start. What can you do today to tackle your debt? It may be something small, but those little things make huge differences over time. I've started this post about fifteen times, sure that I want to talk honestly about debt but unsure of how to start. 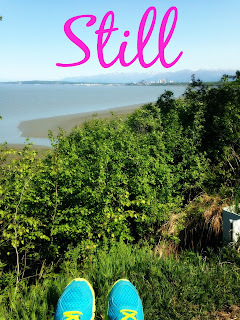 So I started thinking--why do I want to share about my long, arduous journey to get debt free. And then reality sinks in. You already work three jobs (teacher, coach, babysitter) just to make ends meet, so where are you going to find hundreds of extra dollars each check to tackle this debt mountain? It takes you months just to get the 1,000 emergency fund in savings. You cut everything you can, but you still have exactly 75 dollars a month to add to your debt snowball. And so years pass, and you're slowly plugging away, but some months you fail. You use a credit card for a vacation you're desperate to take. You blow your emergency fund on "extras" instead of emergencies. And you think you're never going to be debt free, so you might as well enjoy life. So that's why I'm sharing. Because surely I'm not alone in that struggle. 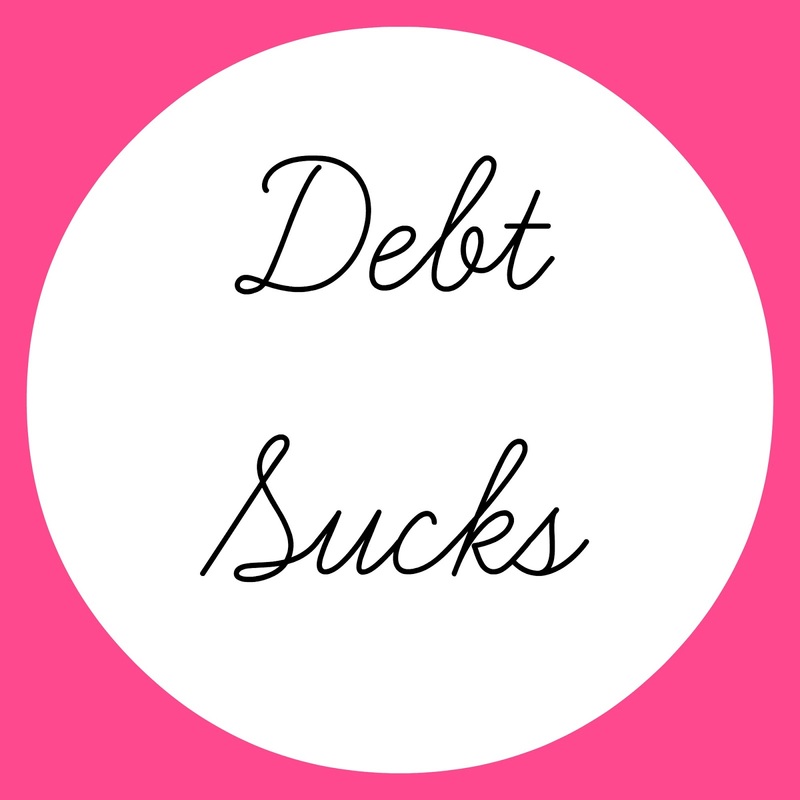 I have so much to say, and I plan to post regularly about different aspects of getting out of debt. But I wanted to start by encouraging people who feel there is no end, the ones who hear those amazing stories of people who got out of debt quickly and then get discouraged. Your story is different. Mine is different. But, there's beauty in the journey. And I want to find it and share it. I have this notebook where I've kept track each month of how much debt I have and how much I've paid off. This is my first entry from April 2010 when I started this journey. I can't believe I'm sharing this. I've only shared this number with a couple people--like literally two people. Feel special. I have no clue why I thought I needed a new outfit from Gap every week. I can't tell you what the heck I bought using that Bank of America card. And Target? Who knows. Proverbs 22:7 "The rich rules over the poor, and the borrower is the slave of the lender." But, it's good to see those numbers because they make me mad. Mad enough to want to change. Because I definitely don't want to be Discover's slave. What's your debt story? 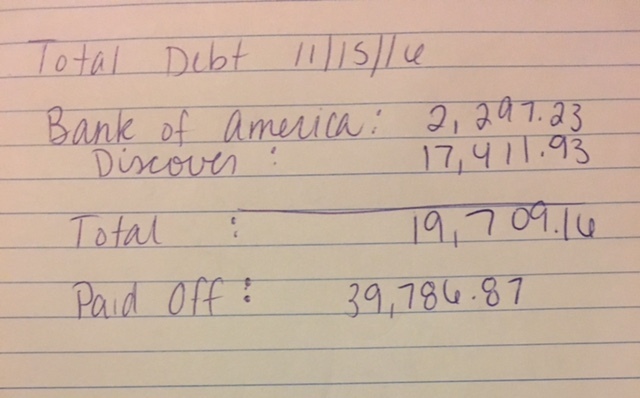 If you've never had the nerve to add up your debt, I encourage you to do it. It will be hard and probably discouraging, but it's the first step. I don’t know when I first fell in love with Chicago. I’ve never been. I don’t have family or even any friends from there. But she has stolen my heart. Maybe it’s because Michael Jordan posters lined my walls and his books filled my shelves. Maybe it’s because I read an article once about Chicago students who were afraid to go to school because of the violence on the streets. I thought of my own students, states away from Chicago but often living in similar unsafe neighborhoods surrounded by preying pimps and the alluring temptation of gangs. Pro-gun advocates love to talk about Chicago. After all, they can make memes about the fact that Chicago leads the nation in murders per year despite having strict gun laws. Those in favor of gun control rarely mention Chicago because it doesn’t fit their narrative. But what gets lost in the shuffle of Facebook debates and Twitter hashtags are people. People who are just like us. People who dream the same dreams for their kids that we do. People who worry daily about becoming a victim of gun violence. 468 people were murdered in Chicago last year. Just stop and think about that a moment. Let that number sink in. Do you even know 468 people? I definitely don’t know 2,900! There are 837 kids at my school. I’m sitting here numb, unable to fathom the idea of over half of them losing their lives in one year. It’s gut-wrenching. It’s the unimaginable that feeds our fears and inspires horror films. But it’s reality for the city of Chicago. Every number is a person, an image-bearer of God Himself. So why are the people of Chicago forgotten? Is it because most of the victims are minorities? Because many are poor? Is it because one murder at a time isn’t a mass shooting and therefore not as newsworthy? As if their 468 lives weren’t valuable. As if the shattered pieces of 468 families can just be put back together. As if 2,900 lives can just go back to normal after they’ve felt the impact of a bullet and lived to endure the nightmares. So, I ask you. When you’re thinking about the devastation in Orlando, please remember Chicago. Post about her. Grieve with her. Pray for her. In Isaiah 49, God makes a promise to His people. 14 But Zion said, “The Lord has forsaken me; my Lord has forgotten me.” 15 “Can a woman forget her nursing child, that she should have no compassion on the son of her womb? Even these may forget, yet I will not forget you. 16 Behold, I have engraved you on the palms of my hands; your walls are continually before me. God has not forgotten the people of Chicago. He loves them. He sees them. He knows them. And if our hearts are beating in one with His, full of love for the lost and compassion for the hurting, then we should remember Chicago too. If you feel led to help, here is a link to organizations in Chicago working to end violence and to help those who have been affected. http://abc7chicago.com/archive/9009544/ **I have not researched all of these organizations, so check them out carefully. 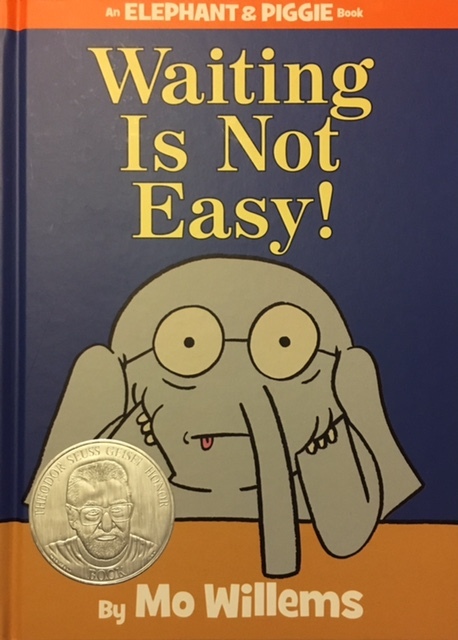 I love Mo Willems. When I’m not sure which book to read to my students, I can always turn to his books for a good laugh. When I ordered Waiting is Not Easy for the library, I expected a good read aloud. I didn’t expect for God to speak to me all twelve times I read it. See, Piggie and Gerald are best friends. Piggie has a surprise for Gerald, but Gerald has to wait. For the next twenty pages, they argue in the funny way only Mo Willems can write. Gerald wants to give up. Surely the surprise can’t be worth all that waiting. After all, he’s waited the whole day. It's growing dark, and the surprise still hasn't come. I scream and holler when I have to wait. I don’t trust that what God has planned for me is good. I don’t believe that His plan will be worth weeks, months, and even years of waiting. So I get impatient. I ask how long, and why, and myriad other questions. But like Piggie is with Gerald, God is patient to remind me that His plans are amazing because they are for my good and His glory. If I’ve trusted Him with my eternity, can’t I trust Him with my present? I’ve got this book of a life, and I can either whine and moan about the wait, or I can enjoy the story, fully trusting God to write a beautiful ending. I bought a copy of the book for my personal library. I have it out on my night stand, next to my Bible. It’s a reminder that even while I’m waiting, God is faithful to speak to me--even if it’s through a children’s picture book. I know I haven't posted in forever. I was posting on Fridays, which meant I had get the posts ready on Thursday nights. Then, Thursdays became busy fairly regularly. And other things took over. But, I hope to be back. Hope. Because life seems to have hit the pause button. Seems as all the major parts of my life are still. And it's discouraging. And full of loneliness. But isn't that when God usually works? In the quietness of our hearts? In the stillness of our souls? So, that's been my word for this year. When I picked it at the beginning of December, I had no clue what God would be asking me to go through, how hard it would be to trust Him when I can't see or understand what He's doing. I trust Him, I believe He's working even when I can't see anything. And I will be still and wait. I love Jesus, books, trees, Alaska, and the Houston Rockets. I write books about teen girls. Time MARCHes on, APRIL flew by, MAY I have your attention, its now JUNE? !